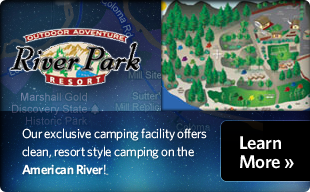 Make River Park Resort your venue for a memorable outdoor special event. We host weddings, Company meetings, Socials and Reunions. Located riverfront on the South Fork of the American River, our resort features modern restrooms, commercial kitchen facility, beer and wine service and acres of usable lawns and wooded areas. Contact us with your special event ideas and we will make the planning process easy for you!